SportsEdTV launches a WATCH & WIN promotion with a grand prize of a coaching day with Australian Open Doubles Champion, Ellis Ferreira. 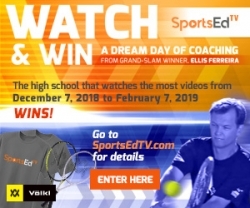 Miami, FL, December 07, 2018 --(PR.com)-- SportsEdTV is giving a dream day of coaching with two-time Australian Open winner, Ellis Ferreira, to the high school that watches the most videos on SportsEdTV between December 7, 2018 and February 7, 2019. High school tennis players, and their friends and family who enter the contest, can also win one of 10 Volkl tennis racquets and one of 150 SportsEdTV t-shirts. The WATCH & WIN promotion kicks off on December 7, 2018 and runs through February 7, 2019. To enter, players, coaches and anyone trying to help their high school win can go to www.sportsedtv.com and click the enter button on the home or landing page. In addition to possibly winning the coaching day, SportsEdTV is giving away 10 Volkl tennis racquets and 150 SportsEdTV t-shirts. There is no limit to how often a person can enter, and the more visits they make to SportsEdTV to watch videos, the better the chances of winning.